The Question Bank Bookmark feature gives you a way of keeping track of frequently accessed Question Banks. When you bookmark a Question Bank, it can be accessed in any other course you teach. 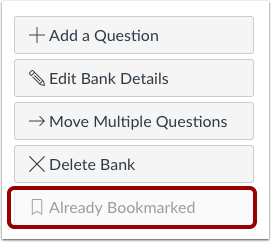 Bookmarks save you time from having to search through Question Banks, especially if your course or account contains a significant number of Question Banks. Bookmarking a Question Bank only affects where that Bank can be accessed. 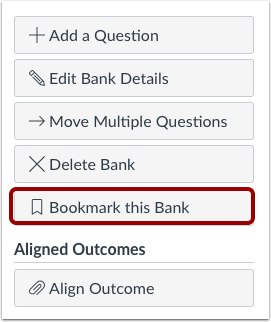 Bookmarked banks can still be used and edited like other Question Banks. Question Banks you create will be bookmarked by default. The bookmark will show a white x to verify the bank is bookmarked. You can also bookmark a Question Bank by clicking the title of the Question Bank. Click the Bookmark this Bank button. Verify the bank is bookmarked. 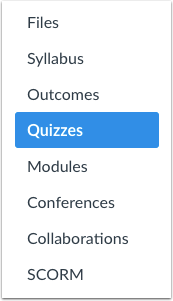 On the Manage Question Bank page, you will see all the question banks for your course. In the sidebar, click the View Bookmarked Banks button to view all the banks you have bookmarked. Previous Topic:How do I create a question bank in a course? Next Topic:How do I unbookmark a question bank in a course? Table of Contents > Quizzes > How do I bookmark a question bank in a course? Re: How do you create a new question bank? Re: Access to bookmarked quizzes?